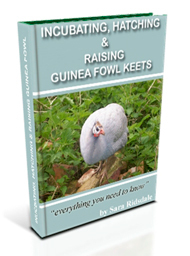 If you are incubating guinea fowl eggs then here is some information about rearing guinea fowl keets once the eggs have hatched. Guinea fowl keets can stay in the incubator for up to 24 hours as they can survive on the yolk sac that was in the egg with them. You can take them out earlier than 24 hours but make sure that their feathers are dry. They need to be placed in a brooder with a heat lamp giving them heat for the first 6-8 weeks after hatching at a temperature starting at about 95-100 degrees fahrenheit (35-38 degrees celsius) for the first 1-2 weeks and then reducing by 5 degrees fahrenheit each week. Guinea fowl keets need a constant suppy of water and they quite like warm water. I use a smallish drinker and place marbles around the drinker so that the keets don’t get their head in the water and end up drowning. The brooder needs a litter on the floor that will stop the keets from hurting their legs. I use corrugated cardboard which I buy from Ascott Smallholder supplies and then I put straw on top. Although saw dust/shavings can be used I think that when the keets are very small they can often mistake the shavings for food. It is very important to make sure that the flooring in the brooder gives the keets traction as a slippery floor can lead to splayed legs. 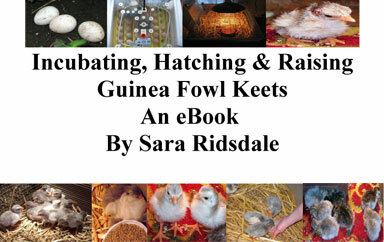 A disease to watch out for in guinea fowl keets is coccidiosis which can kill your keets. 1. I was raised around chickens. Wow what a difference guineas are. I bought 10 from a farm supply and lost 2 right off. Ignorance. We did some research and found they needed a heat lamp. It 90 degrees F. plus temp outside so like I said through ignorance I thought it was warm enough for them. 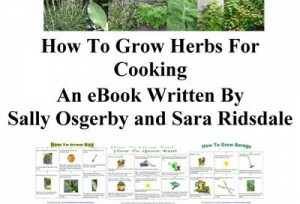 I research as things pop up. I have one little guy of the 8 remaining with splayed leg. They are over 3 weeks old now and research shows I should not be putting them on newspaper which is what they have lived on. So much to know about the little guys. The one with splayed leg is as big as the others and bigger than a couple. He eats well, flies and runs. At this point I probably can’t do anything for him, can I? We are in Arkansas and on rocky hills. We purchased them to take care of the ticks and scorpions we have. Folks around here said they are really good to clear them out. Well thanks for the information provided in your website. It has some in handy, just too late for me. Wish I’d researched before buying. Yes guineas are very different but alot of fun to watch. I think you can probably still cure the splayed leg. You can strap/splint the legs so that they come back into line. This can be done with pipe cleaners, elastic bands or probably best of all an elastaplast bandaid. I would recommend splinting the guinea as soon as possible to help their legs re-align. Let me know how you get on and good luck. I use chopped up straw on the floor to start with so that the guinea fowl don’t think that it is food like they do with sawdust. I often put corrugated cardboard underneath the straw as well.